The Calgary Flames have not had a truly elite player since they shipped, in the throes of a spirited tank job, an imperceptibly decaying Jarome Iginla to the Pittsburgh Penguins for two career minor leaguers and a first-round draft pick. The Flames have a solid, balanced young core that, while undisciplined at times, could make some waves in this year’s playoffs. The young team is paced by 24-year-old Johnny Gaudreau. 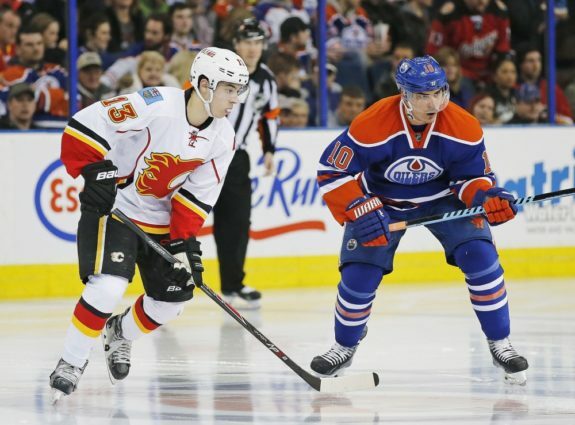 But can Johnny Hockey take the next step into the NHL’s elite? Is he already there? It’s difficult to determine just what exactly constitutes an elite NHL player. Does the definition encompass goalies? Or stalwart defensemen whose puck wins and lane closures don’t make Sportscentre? Or those who dominate stretches of games without really popping out until you’re one day perusing the sports page and realize that, wow, Jamie Benn has scored 245 points over three seasons. For the sake of simplicity, let’s say if you’re a point per game player or have scored 50 goals in the last five years, you’re automatically on team elite. Let’s also stipulate that elite players ought to be among the top five at their position or top ten if they’re a defenseman. It helps if the player in question has won some awards or placed highly in the voting, but it isn’t strictly necessary. 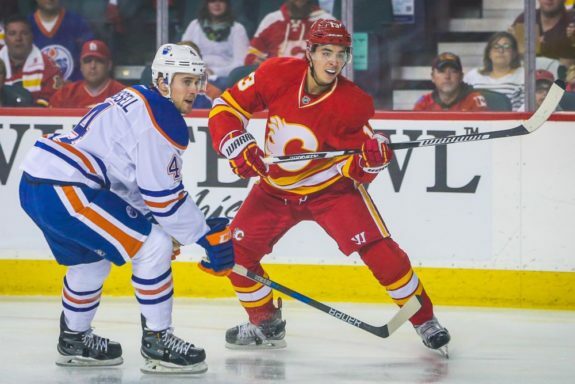 Where does Johnny Gaudreau, the diminutive Flames left winger, fall in this discussion? Calgary snatched the Jersey boy (he was born in Salem, NJ so think more season two of The Wire than season anything of The Jersey Shore) in the fourth round (104th) back in 2011 and he has since become the team’s flagship player. Gaudreau scored 78 points in 79 games in 2015-16 and 61 points in 72 games in 2016-17. That puts him slightly under a point per game at 0.89 PPG. From 2015 to present, Gaudreau has notched 151 points in 161 games, ranking 17th in the NHL. He reached a career high in goals (30) during the 2015-16 season, but it appears unlikely he’ll ever score much more. Forget about 50 goals. Gaudreau may never even reach 40. Sniping is not his game. His shooting percentage has declined each season, dropping from a decent 13.8% in 2015-16 to 9.9% in 2016-17. In this young season, he’s shooting a dreadful 8.3%. To be fair, Gaudreau isn’t the only skater sliding away from the 50 goal mark. It’s become nearly impossible for anyone to reach it. Of all the active skaters, only Alex Ovechkin (who has reached 50 goals seven times), Steve Stamkos (twice), Evgeni Malkin, Crosby, Corey Perry and Jaromir Jagr (three times, but not since 2005-06) have lit the lamp 50 times. Last season, none hit that mark and only three topped 40 goals. Sidney Crosby scored 44 goals in 75 games, Toronto’s Auston Matthews scored 40 in 82 games and Tampa Bay’s Nikita Kucherov also scored 40 in 74. Is Gaudreau a Top Left Winger? Johnny is undoubtedly a top-10 left winger, but he’s certainly outside the top five. Those better than Gaudreau include Kucherov, Ovechkin, Dallas’s Jamie Benn, Chicago’s Patrick Kane, and Boston’s Brad Marchand. You can put those five in whichever order you see fit, but most would agree they orbit the throne. Gaudreau sits in the next tier with Vladimir Tarasenko, Patrik Laine, Phil Kessel, and so on. 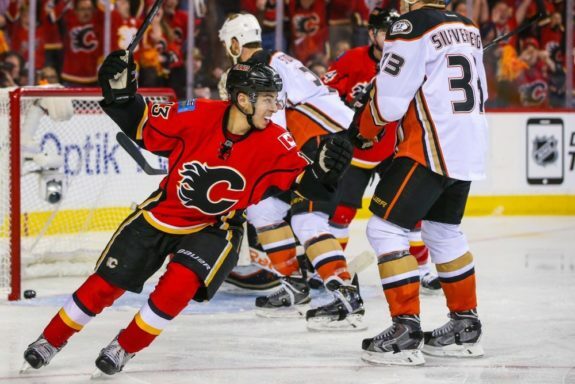 Gaudreau is one of the NHL’s most exciting players. He’s a smooth, explosive skater with Professor X anticipation and a knack for finding an open player in traffic. His dazzling puck-handling makes him a good possession hockey player, averaging +3.0% CF%/rel. Johnny, at this point, is a one-way player, not due to effort or desire but because he’s so obviously small. He’s appeared slightly larger this season but unless BALCO starts shipping unmarked packages to his PO Box, I doubt he’ll ever be big enough to muscle opponents off the puck or win wars in the corners. He still only weighs 157 pounds. Even if Gaudreau possessed the feistiness and plain old mean-spiritedness of Theoren Fleury, his size may still limit his durability. If Gaudreau is injury prone (which he hasn’t necessarily proven he is), it wouldn’t prevent him from one day becoming elite (Sid the Kid has missed significant time in his career) yet it remains one reason I have kept him out the elite group, for now. He’s young with enough skill to one day become the best left-winger in the league. He just falls slightly short (pun not intended) right now.